Adam Pendleton is a conceptual artist whose work moves fluidly between painting, publishing, photographic collage, video, and performance. As part of The Weekends, Pendleton will present a series of filmic portraits during the event. Lorraine O’Grady: A Portrait (2012), inspired by Gertrude Stein’s textual portraits, presents a chronology of O’Grady’s work as a conceptual artist in New York since the 1970s and the artist reflecting on her familial relationships. Satomi (2009) is a silent six-and-a-half second looped video of the lead singer of the American indie rock band Deerhoof, Satomi Matsuzaki, working on a new song in a recording studio. Satomi stages Pendleton’s formal commitment to repetition and narrative abstraction. Just back from Los Angeles: A Portrait of Yvonne Rainer (2016–2017) is Pendleton’s most recent portrait. 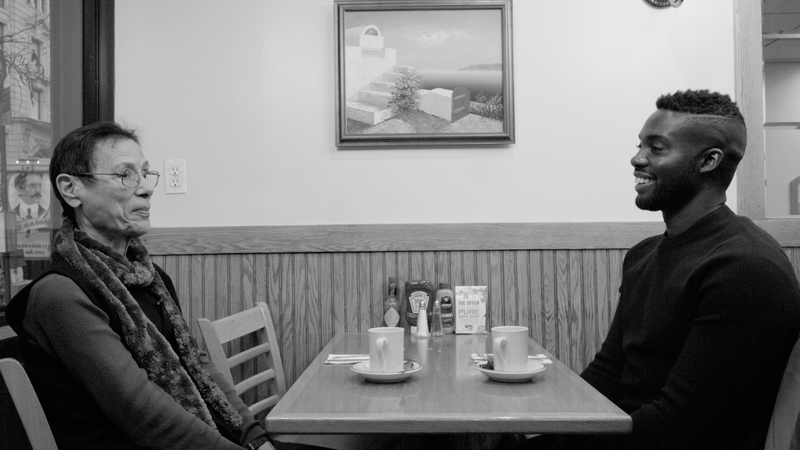 The video poetically captures the choreographer, filmmaker, and writer Yvonne Rainer in conversation with Pendleton at a diner in NYC’s Chelsea neighborhood. All portraits are held together by their (re-)presentation of the impossibility of summarizing who someone is; how any kind of representation is ultimately a conversation with some form of abstraction. The film screening will be held at the cinema BABYLON on Friday, February 24, 2017, 7 pm, followed by a conversation between the artist and Krist Gruijthuijsen, director of KW Institute for Contemporary Art.